This fee makes it possible for us to host Nawang Khechog in Louisville! Thanks! While it is easier to be concerned with day-to-day work stress, finances, and the greater chaos that affects our lives—such as terrorism, war, and intolerance—it is not always the grand plans and ideas that truly change humanity. Sometimes it is as simple as the practice of Kindness, Compassion and Love. In Nawang Khechog’s view, one of the wonders and marvels of being human is that we can choose to nurture and cultivate kindness, compassion and love. These precious human values, he has found from his studies and experience are the foundation of true happiness and are at the core of humanity’s possibility of peaceful coexistence with one another, with other species, and with our environment. Awakening Kindness is a workshop that explores contemplative and practical tools for deepening unconditional love for ourselves, our human family, and the natural world. Tools include: Observing "72 Hours of Kindness", Walking Kindness, Universal Dance of Kindness, Chanting of Kindness and Compassion, Embracing Kindness Circle, Sharing Stories and in depth teachings on Kindness, Kindness Meditation. Based on his years as a monk, studying Buddhist philosophy and meditation with His Holiness the Dalai Lama, Nawang’s presentation will include ways we can enrich our lives by simply being kind to each other and ourselves including Observing a Day of Kindness, Walking in Kindness, The Universal Dance of Kindness, The Chanting of Kindness and Compassion, and A Kindness Meditation. Some partial scholarships are available: request to DrepungGomangCompassion@gmail.com. NAWANG KHECHOG was a Buddhist monk for 11 years, including four years as a hermit meditator in the Himalayan foothills personally guided by His Holiness the Dalai Lama. He has studied Buddhist philosophy and meditation with His Holiness the Dalai Lama, as well as many other Tibetan masters. For these reasons, he fills a unique spot in Buddhist culture as a teacher, performer, practitioner, and Tibetan freedom fighter, as well as being a Grammy-nominated musician. Having spent more than thirty years in India as a Tibetan refugee, Nawang now lives Colorado and continues sharing the values of universal kindness and compassion in workshops across the country. 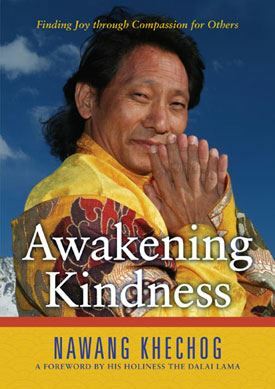 He is the author of Awakening Kindness: Finding Joy Through Compassion with Others. On the evening of the presentation, Sunday, April 23, 7-9:30pm, Nawang will be a featured musician at the Tibetan Freedom Concert at the Kentucky Center.